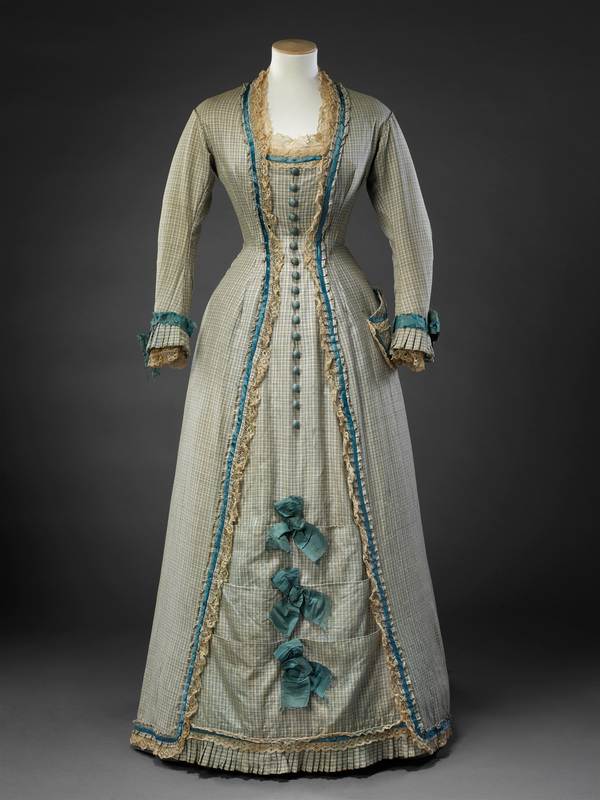 This style of one piece dress, cut from shoulder to hem without a complete waist seam, was known as the princess line. 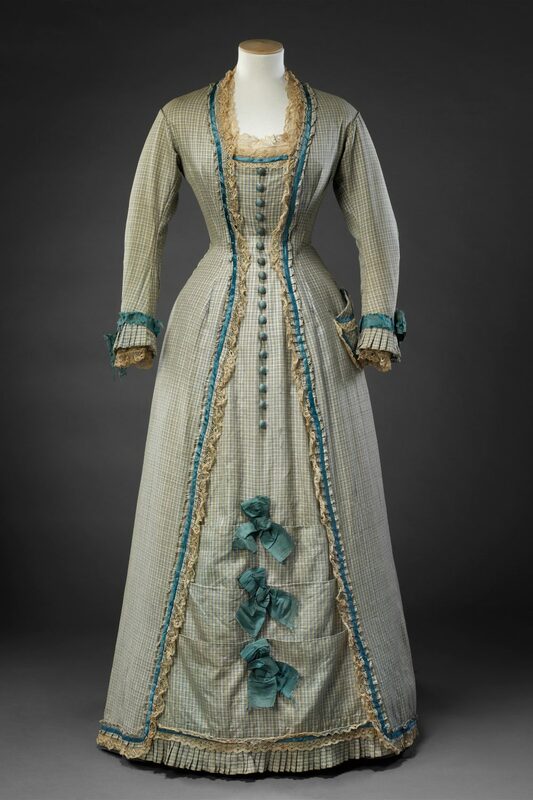 Particularly popular in the late 1870s and early 1880s it is said to have been created by the great couturier Charles Worth earlier in the 1870s, and possibly named after the elegant Princess Alexandra of Wales. It was characterised by a smooth silhouette, particularly over the waist and hips, continuing gracefully down to the hem. 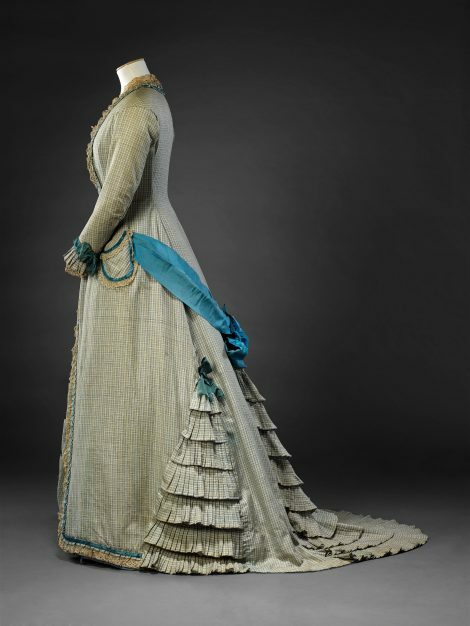 After several years dominated by the bustle, women’s dresses appeared to collapse downwards stylistically, as if the bustle had been allowed to collapse. 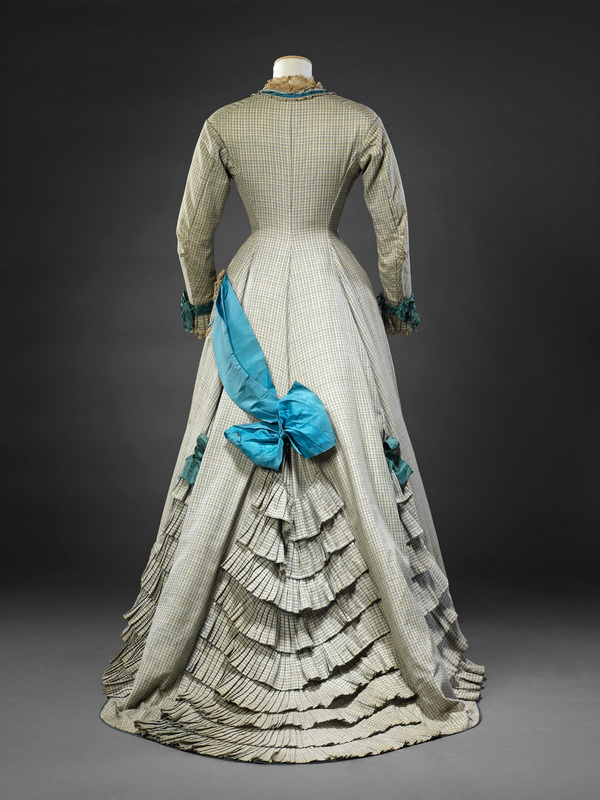 In this example the eye is led downwards by the centre front panel bordered with lace and a narrow band of blue silk, and seventeen blue buttons pointing towards three large ribbon bows, each marking a horizontal tuck that seems to be taking up slack above the hem. The pocket is set low on the hip, and the sole decoration on the sleeves is at the wrist. It is at the back, however, that this downward emphasis is most dramatically evident where a diagonal band of broad blue ribbon leads to the point at the centre back from which the skirt cascades into a waterfall of pleated frills flowing down into the train (see Additional Images). On each side a smaller panel of frills stems from a blue ribbon bow. There are several dresses of this date in the John Bright Collection employing variations of cascading frills on their skirts.